In a small saucepan, add balsamic vinegar and brown sugar. Stir until sugar dissolves. Simmer for 5-6 minutes. Remove from heat, add vanilla and set aside to cool. In a medium mixing bowl combine strawberries, blueberries and pepper. Add half of the balsamic syrup and toss gently to coat the berries. In a martini glass or serving dish of your choice, spoon the balsamic berries over yogurt, ice cream, fresh ricotta or all by itself. Garnish with a sprig of mint. Pass the additional balsamic for a little extra drizzling. Enjoy! 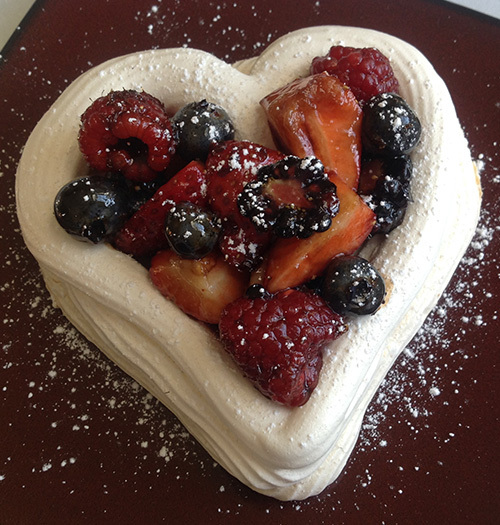 Note: Serve in a simple merengue heart for romantic occasions!